The relatives of a 66-year-old woman who died in a Charles County house fire early Wednesday said they would rebuild their family home - even as they remember their matriarch as a generous woman who was quick to offer a home and help to those who needed it. In an exclusive interview with News4's Erika Gonzalez, Geraldine R. Key's grandson, Johnathan, said his grandmother was known for opening her door to people who had no place to go. "She'd do anything for anybody," he said. "We have had so many people stay in that house, people she knows, people she didn't know. If you needed a place to stay and had no place to go, you could always go to her." Now, her own family is displaced. The family is staying in a hotel paid for by the Red Cross for a few days, but then will have to find a place to stay. The violent fire was apparently sparked by a kerosene heater, authorities said. 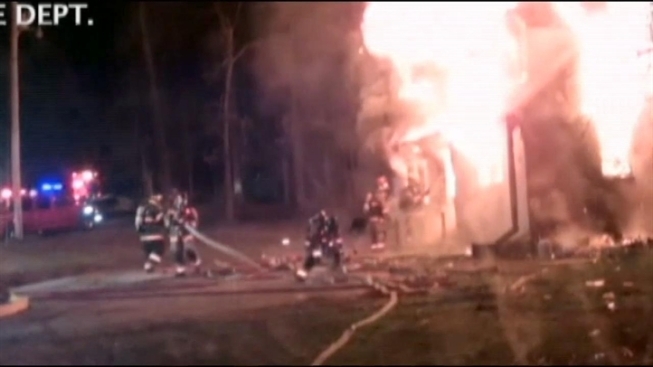 The fire broke out around 1 a.m. at 5315 Stuckey Road in rural Indian Head, Md. Authorities say that despite family members' efforts, Geraldine R. Key couldn't escape from the fire in her bedroom. The rest of the family was forced to flee the house, which was fully engulfed when firefighters arrived. "No one deserves to go like that, especially my grandmother," Johnathan said. Since the home was located in a rural area, there were no fire hydrants, and firefighters had to bring in tanker trucks to fight the blaze. One firefighter sustained a burn injury at the scene. The home was destroyed.